We identified on this page some of the sections of the Draft Local Plan published by Ashford Borough Council that relate to or will affect South Ashford. This is not a complete list and we strongly encourage you to read as much of the plan as you can. We have now updated these pages to reflect the changes proposed under the Council’s July 2017 consultation on Main Changes to Local Plan 2030. We have provided some extracts from the Draft Plan but links after the sub-headings link to the full text on the Ashford Borough Council Consultation Portal for the 2016 Draft Local Plan and, where applicable, the 2017 Main Changes. We welcome your comments on individual parts of the Plan. If you wish to submit your own comments to Ashford Borough Council, you can do so from their consultation portal. 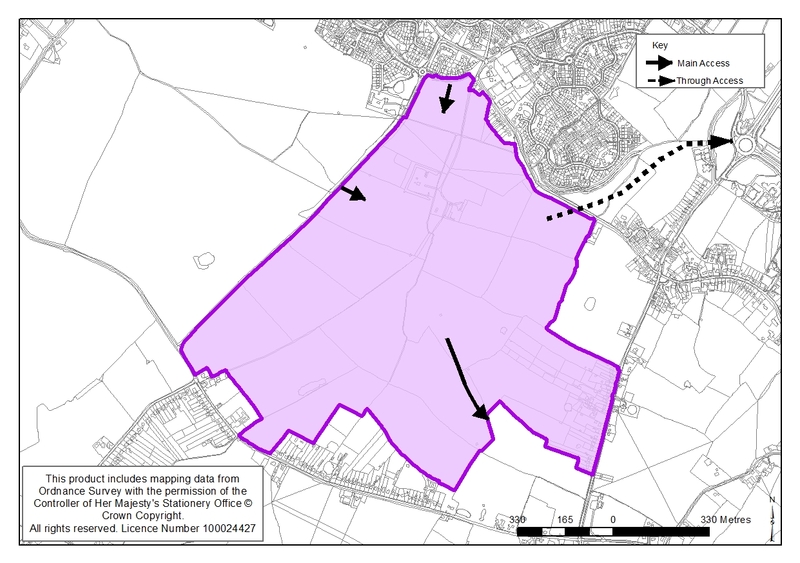 The area covered by the policies relating to Ashford Town Centre includes most of the area included in the 2010 Town Centre Area Action Plan (TCAAP) including the previous “Southern Expansion Quarter” and “Station Quarter” but this now excludes South Stour Avenue and Eastmead Avenue. 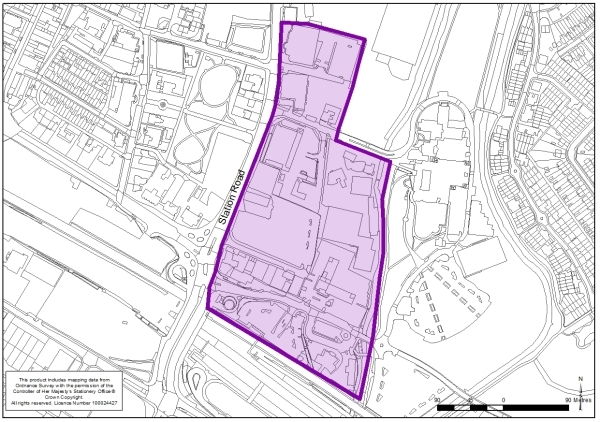 Other areas excluded are the area to the North of Somerset Road (the Residential Transition Quarter) and the area of the Godinton Way development. With the exception of the Commercial Quarter, which is now addressed by a site policy, the Draft Local Plan does not refer to the Quarters adopted in the 2010 TCAAP. principal uses may be acceptable including retail, offices, leisure, residential and hotel. Other complementary uses may include, voluntary and community uses and health facilities. Proposals in the town centre will need to comply with sequential test requirements set out in policy EMP9 . 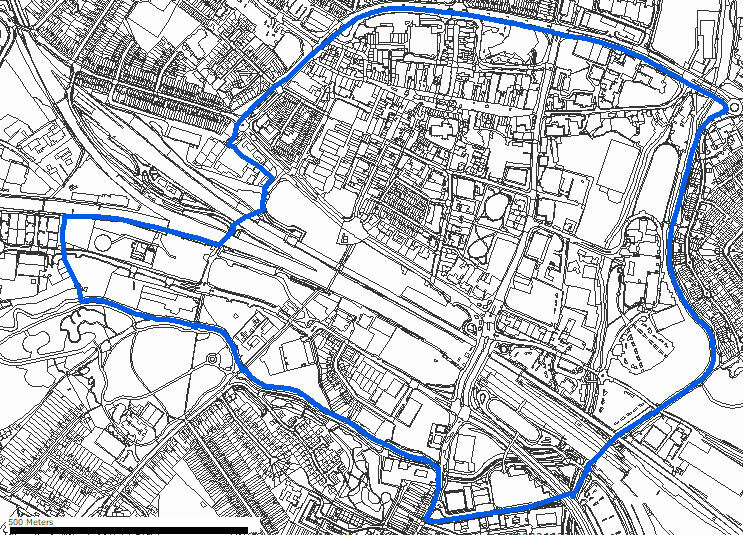 The area to the north of the railway station is as included in the 2012 Town Centre AAP extended to include Templar House, Kent House and the bowling alley and car park.. Although outside of the South Ashford Area, the proposals here will impact on the route from South Ashford into the Town Centre. Planning permission has been granted for some work in this area, with work starting shortly. This area, adjacent to the stations, will become the dynamic new main business sector of the town – a new office quarter complemented with smaller scale residential, retail and space for eating and drinking. Different parts of the site have different roles to play. In the Dover Place area, there is potential to reuse heritage buildings and create new flexible space to house smaller office users. The riverside frontage of the site is well suited to a residential-led mix of uses providing riverside access and direct pedestrian access over a new bridge to the South Park and Stour Centre. The listed Whist House should be restored as part of the development of this part of the site either to its former residential use or a suitable alternative use. The northern part of the site also includes existing offices and Ashford Bowling, alongside a public car park owned by the Council. 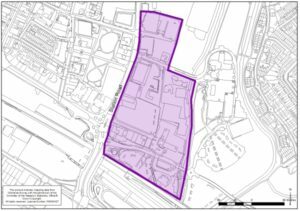 This land is not required to come forward to deliver the level of development envisaged in the policy below but are suitable locations for office development and are well placed to respond if the Commercial Quarter develops as proposed. The car park is considered a suitable location for a future Multi Storey Car Park. Unlike many parts of the town centre where a predominant, historic scale of 3-4 storeys exists, there is the opportunity for larger scale development blocks here. The topography of the Quarter slopes away from the town centre so that taller buildings are less prominent and, of course, International House is a existing landmark feature. It is not proposed to replicate the height of International House – development fronting Station Road should average 5-6 storeys. There may be scope for building(s) of 7-8 storeys closer to the centre of the Quarter and International House but this would depend on a clear design rationale being agreed for the site as a whole and this would need to be tested through detailed modelling. On the riverside, 2-4 storeys is likely to be the appropriate range. This is the first of three of sites in Kingsnorth, not forming extensions to Park Farm, that will increase the built up area to the South of Ashford and will affect traffic passing through South Ashford to the M20 and Town Centre. The total area of these sites is larger than Park Farm but it is not intended that the development should take place on the whole area. We produced a composite map showing the indicative areas of development as proposed in the 2016 version of the Draft Local Plan. Changes to wording in text accompanying Policy S3 is likely to lead to a change in the areas that are developed. Changes to Policies S4 and S5 increase the total number of dwellings from 1370 to 1500 on the three sites together with 800 sq.m of retail and employment space and a two form entry primary school. The site lies to the south of Pound Lane, east of Long Length and north of Magpie Hall Road. It is largely flat, arable and grazing land which lies partly within the floodplain of the Whitewater Dyke which passes through the site. 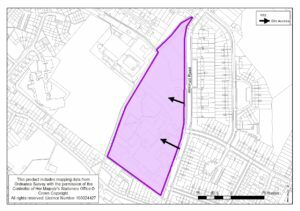 The site is proposed for up to 950 dwellings, although a final site capacity should be determined following a detailed and inclusive site masterplanning exercise that should inform any planning application for development on the site. The built footprint should be on the northern half of the site to enable closer links to the existing development to the north. This will necessitate the remodelling of the Whitewater Dyke’s floodplain to the southern part of the site which in turn should be set out to provide publically accessible open space and ecological mitigation areas, that will form an extension of the Discovery Park. To provide a focal point for the community, the development shall also include a ‘local centre’ for the provision of day to day retail services of up to 450 sq.m. This will also need to include land for the provision of a new two form entry primary school to serve the local area, and up to 350 sq.m. of serviced local employment (B1) space. A Community building should also be provided at the local centre. 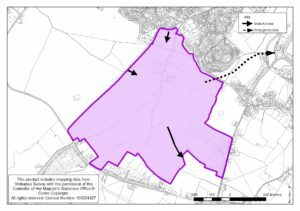 We produced a composite map which showed the indicative areas of development on the three sites to the South and West of Kingsnorth as indicated in the 2016 version of the Draft Local Plan. This site lies to the north of the Steeds Lane/ Magpie Hall Road axis and either side of the Ashford Road. The site is in predominantly agricultural use with scattered homes and clusters of houses with a more linear pattern of development along Ashford Road adjoining the site. This site is proposed for residential development of up to 320 400 units. The northern extent of built development here needs to be carefully controlled. Development should sit below the ridge line that lies south of Kingsnorth village, with the ridge and the space between it and the village itself forming a strategic open buffer to protect the setting of Kingsnorth and create a sense of separation from the new development. Careful consideration will need to be given to the impact of the proposed development on the parcel of Ancient Woodland (Isaacs Wood) within the boundary of the site on its eastern side. This could include the development of an appropriate management and access strategy, but will always involve its conservation and enhancement as part of the overall design of the area. This site lies to the south of Pound Lane and west of Ashford Road. It is flat, arable land that provides part of the setting of the village of Kingsnorth, which lies to the north and east. 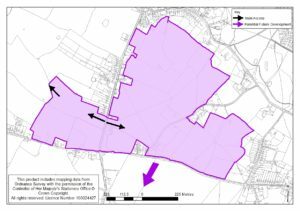 The site also adjoins the proposed Court Lodge Farm site allocation to the west. The southern part of the site should remain free from development so that it may form part of a broader swathe of open space that runs south of Kingsnorth (to the east) to the extension to the Discovery Park (to the west) and provides for the physical separation of Kingsnorth village from new developments to the south. This area should be publically accessible with pedestrian and cycleway links created across it that will form part of a wider pedestrian / cycleway network linking Discovery Park. A mid-range net residential density of around 25dph is likely to be appropriate here which would generate a residential site capacity of around 100 dwellings. The capacity of the site will be determined following a comprehensive masterplan exercise, but is proposed with an indicative capacity of 150 dwellings. 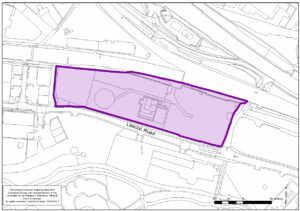 This site represents the remaining undeveloped land on Leacon Road between the Powergen Site, for which planning permission has recently been granted, and the Brookfield Industrial area. Residential development should be the principal use on this site and should be in the form of mainly flatted accommodation, however townhouses are also acceptable. They should be designed in a way that provides a strong street frontage to Leacon Road and generally range from 3 to 4 storeys in height. In addition, there may also be scope to include complementary small scale retail or office uses at the ground floor. With this in mind, residential development provided at ground floor level facing Leacon Road shall have internal heights that are a minimum of 4 metres, to provide greater flexibility for uses at ground floor level. 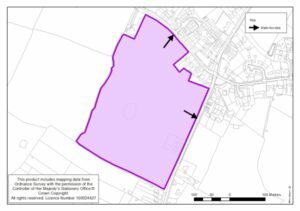 Proposals for developing the site will need to be accompanied by an assessment of any contamination arising from the existing or previous uses and proposals will need to demonstrate how any remaining contamination issues can be resolved. This site was include in Policy S11 in the 2016 Draft Local Plan. The safeguarding of part of the site for railway use is a new requirement in the 2017 changes. Provide a connection to the nearest point of adequate capacity in the sewerage network, in collaboration with the service provider. The S11 site as specified in the 2016 version of the Draft Local Plan has been split into two sites. S11 now refers only to the front site, the Brett site, was included in the 2012 Urban Sites and Infrastructure DPD and proposals for this have not changed except the requirement for 30% affordable housing has been omitted. The whole site is considered suitable for a mix of residential and commercial B1-B8 uses and should be developed in accordance with an approved masterplan. The scale of any residential development should relate well to the surrounding area. Residential development along the Leacon Road frontage should be primarily 3 storeys in height reflecting a narrower corridor along this part of the route reducing in scale from development allocated in the town centre to the east. However, the prominent eastern and south western corners could accommodate an additional one or two storeys to create some variety and interest in the streetscape. Development should have a strong built form with well designed frontages to reflect the high quality urban route and a positive built return frontage should also be created along Beaver Lane. Given the location, size and numbers of housing units envisaged on the site, 30% of the dwellings shall be provided as affordable housing in accordance with policy HOU1. 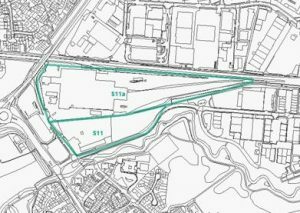 There could be access points directly into the proposed residential scheme from Leacon Road but access to any commercial development at the rear of the site should via the existing Beaver Lane access or potentially from the eastern edge of the site. 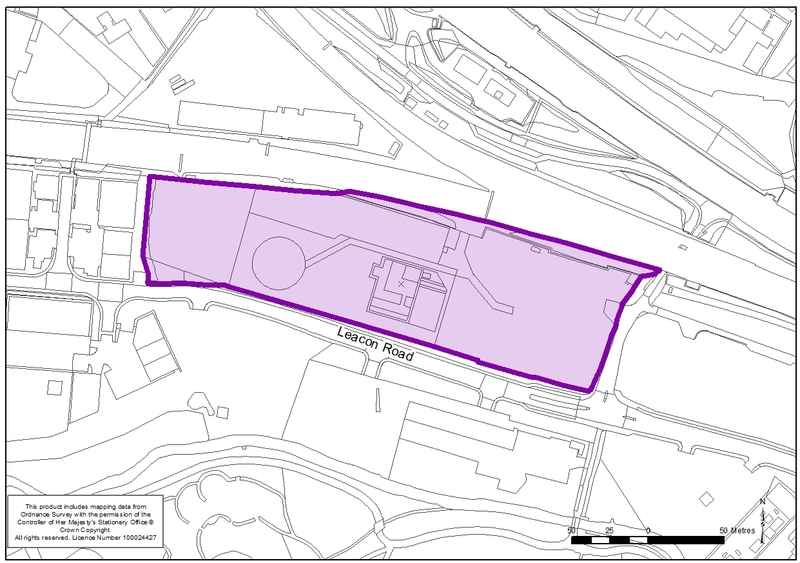 Access to the site should be provided from Leacon Road and/or Beaver Lane. A small strip of land along the southern boundary of the site will be required to fully create the parameters for the Leacon Road / Victoria Road route and this land should not be developed. The site lies opposite the Stour river corridor which lies within the identified green corridor area and proposals on this site should make a positive contribution to the setting, role, biodiversity, accessibility and amenity value of adjacent green corridor area. 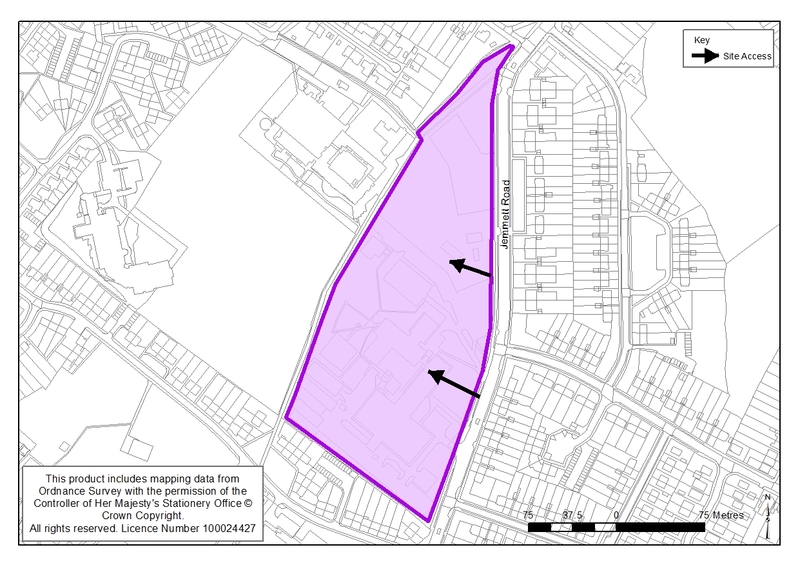 The principle of redevelopment to residential uses has been established on this site linked with the redevelopment of the adjoining Former Ashford South Primary School. Immediately abutting the western boundary of much of the site is the public right of way, Jemmett Path, that is also part of the ‘Learning Link’ which is a major north-south enhanced pedestrian / cycleway route from the town centre to Stanhope. Development proposals for the site must not detrimentally impact on the retention or use of Jemmett Path and must widen and make enhancements and improvements to it in order to increase its attractiveness to users. Development of this site must facilitate the ability to bring forward development on the adjacent former primary school site and must be designed to be cohesive with the design approach taken on the adjacent site. As part of the development, two all-movement access points from Jemmett Road shall be provided through to the site boundary adjoining the learning link for vehicular access to site S13 to be created. The design and scale of development here will need to take account of the character of the surrounding residential areas of Noakes Meadow and Jemmett Road and any scheme proposed on the adjoining former school site. The design should ensure that the residential amenity of existing neighbouring occupiers is protected. The site is within close proximity (150 metres) of Victoria Park, a strategic recreation facility providing play equipment for different age groups, areas of open space for informal play and more formal areas of planting. Therefore, a contribution towards enhancement of these facilities at the park may be more suitable than the requirement for development of play facilities on-site. However, the site does provide the opportunity to provide more local areas of public open space, which should form part of the overall site design.